The full glare of the horse racing world may have fallen on Cheltenham last week, but closer to home, the sport of kings has turned the corner on a new era. The Down Royal racecourse at the Maze completed its second race meeting on Saturday under new management. In a bid to breathe new life into the venue, Michael Roden's Merrion Property Group, which has owned the track and nearby golf course since 2006, appointed a new team to run the course in January. Heading that team is Newry-born Emma Meehan. Recruited from a 14-year stint with Dundalk Stadium, she took over from the Down Royal Corporation of Horse Breeders, who had long been associated with the track. The new chief executive admits the start of her tenure was a baptism of fire: "I came in here on January 1 and the rest of the team started the day after. "There were a lot of people doubting our capacity to get racing under way within 28 days, but I was always confident that we would." While the past two-and-a-half months have tested her character and professional abilities, she revealed that she has endured tougher tests in her life. At just 26, she lost her mother Finola, who spent over a decade battling multiple sclerosis (MS) until she passed away in 2006. After that heartbreaking loss, Emma led the launch of the new €35m Dundalk Stadium the following year and in 2008, she married her husband Conor McCoy. "I'll definitely remember that period of my life," she says. The couple now have two children, Oliver (5) and Sadie (3). Adopted by Denis and Finola Meehan as a child, Emma spent her early life in Newry before the family left Northern Ireland when she was six. Emma adds: "It was quite a nomadic early childhood. "My father Denis was in sales, so the greater the territory, the further he had to go, so there were quite a few schools." She lived in Scotland and England with her two younger sisters, Claire and Victoria, for seven years until their mother's health began to deteriorate. Within a year of returning to Newry, Finola was diagnosed with a primary progressive form of MS.
"It was a good call to make for us to come back within the framework of the family unit in Newry, rather than be a bit isolated across the pond," she says. "There was no remission as such. She battled it for 10 years before she sadly passed away in 2006. "It was still a shock, even though she was ill.
"Unfortunately that was what life dealt us a family unit. "But it was a very happy home. We're very close. "Mum was an active women, very involved with us as children. She was just fabulous, very mothering. Kids were everything she ever wanted. "It was a massive loss. Elements of fight or flight came into life. You learn from it and it makes you stronger as an individual. "The fact there was illness at home shaped that and certainly shapes who you are and how you view life." That strength of character came to the fore through her position as sales and marketing manager at Dundalk Stadium. She was recruited by the Co Louth racing venue in late 2004 at just 23 and helped make the stadium one of the most modern and popular venues in Irish racing. She says :"It was great because it was fresh and new. There were exciting plans." Those plans included Ireland's first all-weather poly-track course and a €35m stadium opened in 2007. The racecourse quickly evolved from greyhound to horse racing, hosting 40 races per year. She remained there for 14 years, until Down Royal came calling. "I'm very attached and invested in Dundalk, but this opportunity for Down Royal presented itself and I knew it was the right time for a change," she says. It wasn't an entirely seamless transfer. There was confusion and controversy over the fate of the course late last year when Down Royal Corporation of Horse Breeders and the course owners, Merrion Property Group, prepared to part ways. But Emma and her team extinguished any doubt over Down Royal's future when it hosted its first race meet in late January. "Don't get me wrong, it was a baptism of fire and there was a hell of a lot to do. It was a very fast learning curve, but we did it. I stress we, the team, did it." "They wouldn't necessarily have racing backgrounds," she says of her team. "But I'm an advocate that we don't have to in order to run the business. We're not asking them to go out and ride horses, we're asking them to operate and put together the very best customer experience possible." One major hurdle that Merrion's new team has faced is the loss of considerable Government funding. The Horse Racing Fund, which was handled by the Department of Environment and Rural Affairs (DAERA), is money garnered from bookies for Northern Ireland's two main race tracks - Down Royal and Downpatrick. But the funding is paid to the operator, not the course itself. Changing the terms means changing legislation, something DAERA has said it needs a minister in place to do. Traditionally, the funding has gone into Down Royal's prize winning pot. Without it, the new Merrion team has been left with a £200,000 hole to plug. Emma says: "We've committed to doing that. We will do that, there's no question. "That money is sitting there, our predecessors had access to it. It's just not a level playing field at the moment. We have to get on with it." But while the number of race meets are far fewer than her Dundalk days, Emma says she's excited by the new era at the grade one Down Royal track. "Even though it's 12 fixtures, they're large events, you're talking thousands of people building into a crescendo with a November festival." The new strategy for Down Royal is geared toward incorporating the golf course to develop the site as a prime leisure destination, hosting other events outside the scope of racing. "It's important that we make this a more welcoming place for everybody, even down to the family unit, which is something that was never done before," Emma adds. "We have a marketing plan, we have a strategy to encourage newer groups to come and obviously increase attendances. "That's the short-term, the long-term is looking at the business outside of racing. "People might consider a place for conferences because it could be refreshing to get out of the city to a place like this." She also says Merrion will potentially examine whether the race programme can be expanded. "We would like to see if there's an opportunity for an extended programme here. There are 12 fixtures and there may be an opportunity to make that 13 or 14 over time," she adds. "But I'm conscious that the track, by nature of being turf, it can only take so much." She said it would depend on future negotiations with the all-island ruling body, Horse Racing Ireland. After spending 15 years in the world of Irish racing, Emma says female bosses shouldn't be rare in the male dominated industry. "With racing, there hasn't been too many female bosses. I'm proud personally that I've broken a glass ceiling," she says. "People have been very positive and supportive. I've been in a male-dominated industry for most of my working life. "Maybe it makes you tougher. That's all I've known - being surrounded by men in an industry like this." 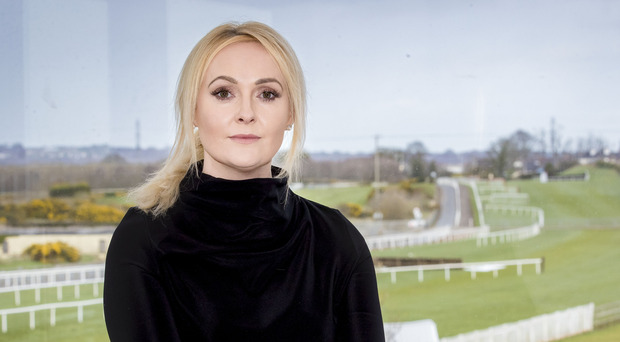 Once again highlighting that Down Royal will remain a hub for Northern Irish horse racing for the foreseeable future, Emma says: "We're here, we hope people will support us and we look forward to seeing them at the meetings that lie ahead. "I've been in this industry for a long time and I want to remain in it. I wouldn't have taken up this opportunity if I didn't have the confidence in Merrion Group's long-term strategy."